Four hundred years ago, Galileo Galilei observed Ganymede in orbit around Jupiter. 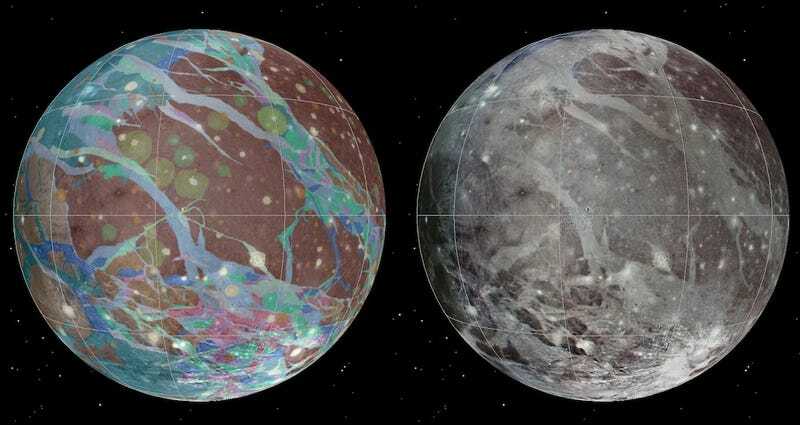 This week, a team of planetary scientists unveiled the first global geological map of our solar system's largest moon. Using images obtained by NASA's Voyager 1 and 2 spacecraft and the Galileo orbiter, a team led by Geoffrey Collins of Wheaton College pieced together a mosaic image of the planet, giving us our first complete image of the geological features of the satellite. Above, you can see the moon centered at 200 west longitude. The darker areas represent the very old and heavily cratered region of Ganymede, while the lighter areas are somewhat younger regions marked with grooves and ridges. The map doesn't just look pretty; it also informs our understanding of Ganymede's geological history. Researchers have identified three geological periods: one involving heavy impact cratering, followed by tectonic upheaval, and then a decline in geological activity. The more detailed images let them study the ridges and groves, and have revealed that the formation of cryovolcanos is rare on Ganymede. According to the Jet Propulsion Laboratory, Ganymede is an especially valuable body to study because it is an ice moon with a richly varied geology and a surface area that more than half as large as all the land area on Earth. If a feature exists on another ice moon, chances are that something similar exists on Ganymede. And now we have a better sense of where to find it.